Several developers from Ubisoft Montreal, of Assassin's Creed and Prince of Persia fame, have split from the company and founded their own private studio called Red Barrels Games. Their first game, Outlast, has been announced for a few weeks, but the first trailer shows off a true horror fest most likely not coincidentally timed with Halloween. Outlast takes gamers into Mount Massive Asylum as an investigative journalist trying to uncover the hospital's dark secrets. Naturally, you find dead bodies sprawled all over the place, the walls redecorated with blood and guts, and irrational monsters out to kill you. 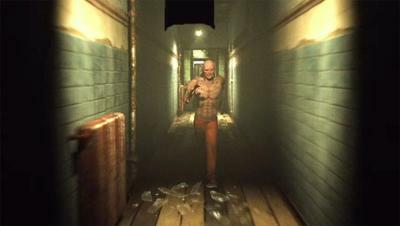 It's a survival horror video game with the logical idea that maybe combat isn't always the best solution, similar to popular sleeper hit Amnesia: The Dark Descent. I don't believe what we are seeing in this trailer is straight up gameplay, but rather just a replication of the first person view that will be like, similar to the BioShock trailers. If that's the case, expect a lot of disorienting chases and platforming to safer areas. Red Barrels website plays up the reporter aspect of the game on their webpage by reveal game updates through fake news articles. I am currently inside Mount Massive, a supposedly abandoned asylum in Colorado, and I've stumbled across an atrocity I can't put into words. The Murkof Corporation is in the middle of creating something unthinkable here—a malevolence that humanity has yet to experience. I fear for my life, and for mankind, because of what I'm witnessing. Video of everything I've seen so far can be found on this tape. I need to find my way out of this complex, but fortunately I have what I need to capture more footage in the meantime… as long as my camera power lasts, at least. Who knows, could be a nice little survival horror gem to show the genre hasn't totally been wiped off the map yet. Outlast will be released next year only on PCs.